Being obese can hurt your health, but it may also make it harder to do your job. According to a new study, obese workers take more sick days than their peers and are more likely to say they've experienced drops in productivity. MONDAY, September 27 (Health.com) — Being obese can hurt your health, but it may also make it harder to do your job. According to a new study, obese workers take more sick days than their peers and are more likely to say they've experienced drops in productivity. Researchers in the Netherlands anonymously surveyed 10,674 workers at 49 companies who performed a variety of jobs including office work, industrial manufacturing, and construction. Compared to their peers of normal weight, the obese workers in the study were 66% more likely to have missed between 10 and 24 days of work due to illness or other health problems in the previous year, and they were 55% more likely to have missed 25 or more days. When they were at work, obese workers tended to be less productive than they thought they should be. Obese people were 29% more likely than normal-weight workers to say that they were 30% less productive than usual on their most recent regular day of work. Other components of an unhealthy lifestyle were also associated with lost productivity. Smokers were 30% more likely than nonsmokers to have taken 10 to 24 sick days in the previous year, and smoking put an even greater dent in productivity than obesity, according to the study, which appears in the journal Occupational and Environmental Medicine. Because it was based on a one-time survey, the study couldn't show that obesity, smoking, or other health factors directly affected sick time or productivity. But the link seems plausible, given the range of health problems associated with both obesity and smoking. Indeed, 83% of the obese workers in the study reported having at least one chronic disease, including heart disease, diabetes, depression, and joint or muscle pain. 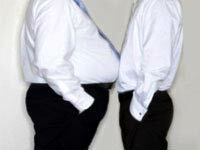 Sixty-nine percent and 75% of normal and overweight workers, respectively, reported having one chronic disease. Rather, Robroek says, the findings suggest that employers should be doing more to encourage their employees to lose weight and stay healthy. "Employers could facilitate healthy lifestyles and pay attention to healthy working conditions," she says. "For example, they can encourage active commuting [and] healthy options in the [cafeteria]." The findings also suggest that obesity is a drain on the economy in addition to being a serious personal health problem, says Linda Barrington, PhD, the managing director of the Institute for Compensation Studies at Cornell University's school of industrial and labor relations, in New York City. "There are still many employers who really need to see obesity among their workers as creating a financial imperative and a social responsibility to act," says Barrington, who was not involved in the new study. More than one-third of U.S. adults are obese, and another one-third are overweight, according to government data. Obese workers cost private sector employers in the U.S. an estimated $45 billion annually in medical expenditures and lost productivity, according to a 2008 report co-authored by Barrington and produced by the Conference Board, a nonprofit business research organization based in New York City. An increasing number of companies are making employee wellness a priority, Barrington says. And rightly so, she adds, since many employers are asking more of their employees than ever. "If you're expecting that kind of time commitment, it's hard not say that this isn't becoming more of your responsibility as well," she says. It's unclear from the study how the results might translate to the U.S., which has a very different population than the Netherlands. Although obesity rates in the Netherlands are rising—12% of Dutch adults were obese in 2009, up from 9% in 2000—they remain far lower than in the U.S.